You can follow UK Drive Systems on Twitter, Facebook and other Social Media sites. More industry news and developments in our Blog and Newsletter. Check out the Dunkermotoren robot golf using a Wii remote control - look out Tiger! Kingda Ka is a steel accelerator roller coaster located at Six Flags Great Adventure in Jackson, New Jersey, United States. Kingda Ka is the tallest coaster in the World at 455 feet high and the fastest in North America. This remarkable thrill ride breaks all world records for coaster speed and height, zooming from 0 to 128 mph in 3.5 seconds and catapulting you 45 stories into the sky. When the signal to launch is given, the train rolls back slightly (to engage the catch car) and the brakes on the launch track retract. You will hear a voice announcing "arms down, head back, and hold on". The launch occurs five seconds after the hissing sound of the brake fins retracting. The hydraulic launch mechanism accelerates the train from 0 to 128 miles per hour (0 to 206 km/h) in 3.5 seconds. The hydraulic launch motor is capable of producing 20,800 peak horsepower (15.5 MW). The train climbs the main tower (or top hat) and rolls 90 degrees to the right before reaching a height of 456 feet. 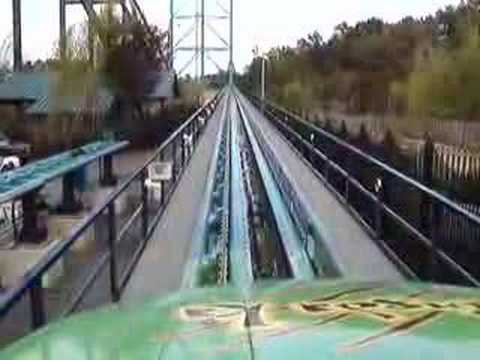 The train descends 418 feet (127 m) straight down through a 270-degree right-hand spiral. Then climbs the second hill of 129 feet (39 m), producing a moment of weightlessness before being smoothly brought to a stop by the magnetic brakes. The ride lasts 28 seconds from the start of the launch.